Visiting Orlando in November? Here's a Special Invite Just For You! If you are going to Orlando, we're happy to offer you a 100% savings on the cost of an Expo Pass to the International Pool | Spa | Patio show. Your cost will be ZERO! Click here and we'll see you at the show! 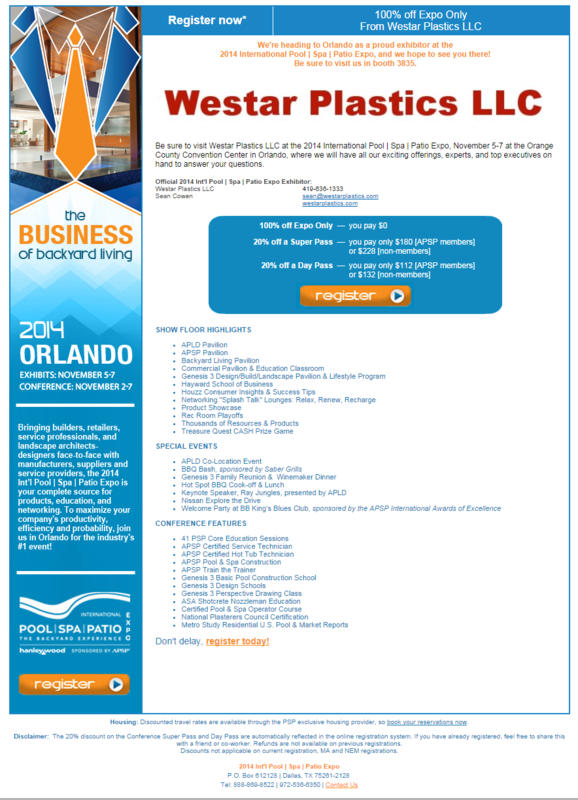 This is the Special Invite to receive a 100% discount off of entry into the 2014 International Pool | Spa | Patio Expo in Orlando, Florida on November 5-7, 2014. Click on the REGISTER button to receive your FREE PASS! Newer PostOur Little Store Is Now Up and Running! Older PostMade In The USA is not just a slogan for us, it's Real!